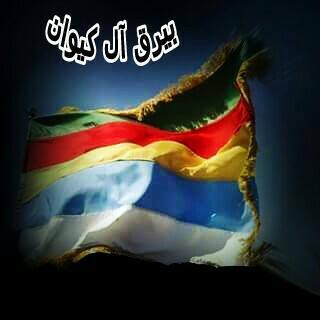 On 4 September, the Druze sheikh Abu Fahad Waheed al-Bal'ous and a number of his associates within his Rijal al-Karama ('Men of Dignity') militia were assassinated in bomb attacks in Suwayda. 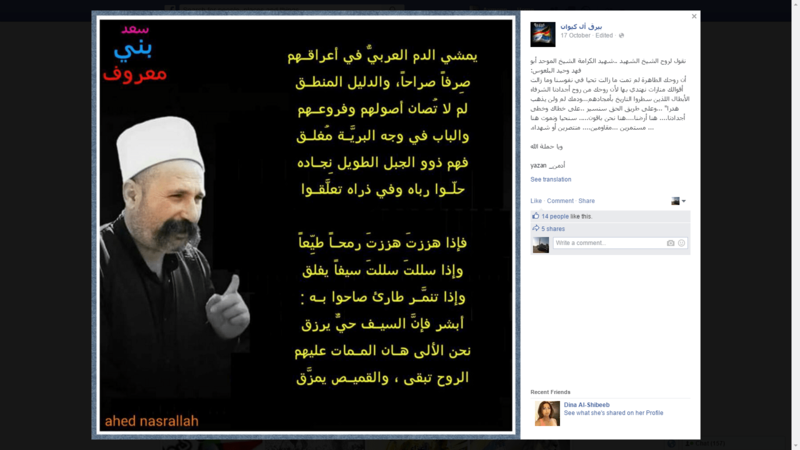 Bal'ous- a very popular figure on Druze social media- had advocated a 'third-way' line that called for reform within the existing regime system in Suwayda province rather than revolution. This agenda focused on anti-corruption as well as prioritising local defence over forced conscription into regime forces to fight far-off battles within Syria. Though Bal'ous was often perceived wrongly by outside observers as an opposition/revolutionary figure, many Assad loyalists in the province undoubtedly viewed him as a threat to regime authority, and are accordingly the most likely culprits in the assassination. Initial hype on social media in the aftermath of the assassination asserted that the 'revolution' had come to Suwayda with dubious claims of the supposed raising of the revolutionary flag, toppling of a statue of Hafez al-Assad and a fake Rijal al-Karama statement declaring that "Jabal al-Arab [Jabal al-Druze/Suwayda] is an area liberated from Assad's gangs and their troops." The actual prevailing atmosphere has been one of calm with no further escalations by Rijal al-Karama or pro-Assad factions like Dir' al-Watan, as all sides appealed for calm. Following the death of Bal'ous, Rijal al-Karama officially declared his brother Sheikh Abu Yusuf Ra'fat al-Bal'ous as the new leader. As Ra'fat was injured in the attacks, it was necessary for him to recover in order to be able to assume actual leadership and issue an official statement, which I have translated below. Analytically, several points are worth noting from the statement, which was first released on 17 October. a) The statement casts doubt on the regime media narrative– deemed "comical theatrics"- that blamed the Suwayda bombings on one Wafid Abu Turaba/Turabi. This narrative included a televised 'confession' on Wafid's part and has unsurprisingly been widely derided. Instead, the statement implicitly blames the assassination on actors linked to the regime, claiming that the explosives used are of the sorts only possessed by states, and that there was a link to intelligence planning at the most senior levels. The alternative interpretation of the relevant parts of the statement- supposing a foreign-backed conspiracy against Bal'ous- does not seem plausible. b) Despite implicit blaming the assassination on regime loyalists, the statement clearly shows that Rijal al-Karama intends to continue operating within the framework of regime authority existing over Suwayda and has no interest in confrontation. Particularly noteworthy in this regard is the insistence on ultimately respecting the authority of the mashayakh al-aql: Druze spiritual figures whose opinions remain vital in determining the general framework and atmosphere within Suwayda province. Two of the mashayakh al-aql, Sheikh Jerbo and Sheikh Hanawi, are involved in the pro-Assad Dir' al-Watan faction that has been competing for influence with Rijal al-Karama. However, following on from Bal'ous' assassination, Hanawi in particular reached out to Rijal al-Karama in a bid to calm tensions, and for this reason he is singled out among the mashaykh al-aql for thanks in this statement. Sheikh Hanawi [just left of centre] at a reception commemorating Bal'ous on 9 October with other mashayakh and Rijal al-Karama. The point is not that the Rijal al-Karama have to show the same level of pro-Assad loyalism as the mashayakh al-aql, who, as Tobias Lang notes, are "completely co-opted by the regime." Rather, the co-optation of the mashayakh al-aql has determined an environment that cannot envision Suwayda outside regime authority, and thus no one can seriously advocate overthrowing the regime in the province. When this point is noted along with the fact that there is no viable alternative forthcoming from opposition forces, it becomes clearer why it is more accurate to characterize Rijal al-Karama as reformist, with an emphasis on not attacking the fundamental foundations of the Syrian state or the Syrian army. c) Though Rijal al-Karama officially respects the Syrian army as a Syrian nationalist institution and thus in principle does not object to cooperating with it in Suwayda province to repel incursions and supports its resistance to rebel attempts to attack other Druze localities like Hadr in Quneitra, the group recognizes the nationalist spirit is not compatible with the extent of the regime's reliance on foreign forces in the wider fight across Syria. The issue of foreign forces making their mark is not so apparent inside Suwayda itself on account of the calm of the situation relative to other provinces with fierce fighting fronts like Aleppo and Hama. Hints of discontent at the heavy dependence on foreign manpower- principally in the form of Iranian proxy militias- can even be found within some staunchly pro-Assad militia circles. This dependence allows these foreign actors to carve out their own spheres of influence within what remains of the regime rump state. For instance, Hezbollah has most notably been projecting its influence into Homs province in the development of 'Syrian Hezbollah' in the form of Quwat al-Ridha. Meanwhile, areas outside regime authority are set to see jihadi actors like the Islamic State and Jabhat al-Nusra as players for the long-run. All of this is apparent to Rijal al-Karama- hence the question about whether the land really belongs to Hezbollah, Iran, the jihadis, or now the Russians who have intervened directly. "Bayraq al-Izz, Bayraq al-Fahad, Bayraq al-Haq, Bayraq al-Sheikh, Bayraq al-Nidal, Bayraq al-Basha [Pasha], Bayraq al-Fakhr, Bayraq Sayf al-Jabal, Bayraq al-Meqdad, Bayraq al-Nabi Dawoud, Bayraq al-Khidr, Bayraq al-Harm and many others besides them. These are examples from them of banners (Bayariq) to protect the land, honour and religion, as is the path outlined for them by Sheikh Abu Fahad that they will fulfil under their leader Sheikh Abu Yusuf [Ra'fat al-Bal'ous]." Similarly we call on all noble ones to stand side by side to defend the land of the beloved Jabal and raising the banner of Truth, for Truth is the beloved of God that we may revive the ancestors' history and follow the course in the path of Dignity. And we pledge to all of you that we will be bullets in the rifles of those who defend our land and swords in the face of the apostates [sic: 'aggressors' is probably meant] coveting its soil. Long live you and the Jabal. Rejoice, Abu Yusuf, at the honour, oh students of Dignity. Rejoice, Abu Yusuf, at the victory, oh attire of the turban. Rejoice, oh Jabal of ours, at the blood of your men in nobility and audacity. Rejoice, oh Jabal of ours: we are your guardians till the Judgement/Resurrection." 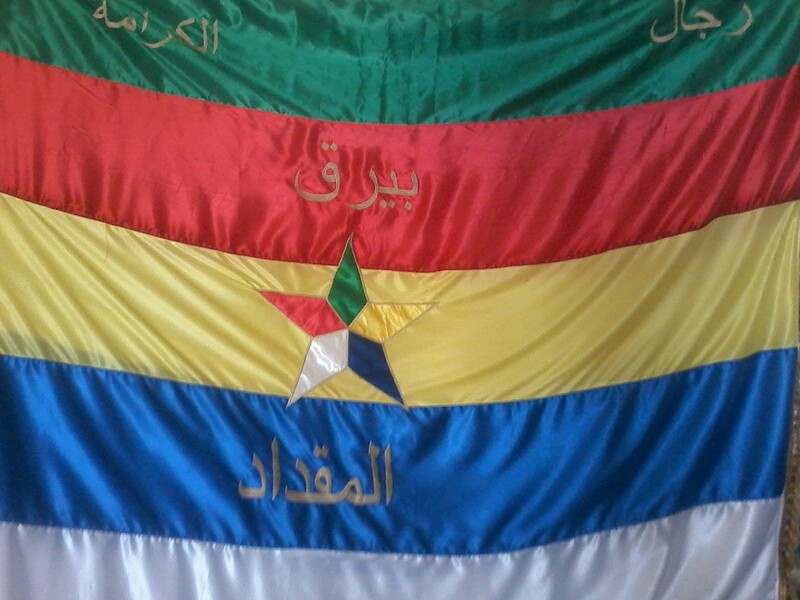 Bayraq al-Meqdad flag: note Rijal al-Karama inscription on the top of the flag. "Your pure soul has not died and continues living in our souls and your words continue to be lights by which we are guided because your soul is of the soul of our noble heroic ancestors who made history by their glorious deeds. And your blood has not and will not be squandered in vain. And we will go on the path of Truth, in your steps and the steps of our ancestors. Here is our land, here we remain. We will live and die here, continuing, resisting, victorious or martyrs. Wa ya hamlat Allah." The Bal'ous tribute very much matches the Bal'ous-aligned sentiments of a statement issued by Bayraq Al Kiwan on 20 August outlining the group's aims. For instance, point 4 affirms: "We are aligned with Truth only, and not the loyalist or oppositionist. Our loyalism is to the land, the homeland and the people. And our resistance is against all types and forms of enemies of the land and humanity." Similarly, point 5 declares: "We do not attack anyone, and we do not oppose anyone, except in Truth...We defend against, wage war on and resist whoever attacks until the last drop of our blood, and we have pledged to be shields for that." Other points in the statement call for peaceful co-existence with all people in principle, particularly focusing on the various sects and ethnicities as well as internally displaced persons currently residing in Suwayda. Thus it can be seen that Bal'ous' death has by no means spelled the death-blow for the Rijal al-Karama. On the contrary, the brand remains potent. e) Considering Bal'ous' popularity on social media and in the Druze diaspora, it is hardly surprising how extensive the commemorations of him were in the aftermath of his assassination, particularly in Lebanon, Jordan and Israel. Note though that Rijal al-Karama refuses to refer to Israel as a country by name, extending tribute instead to the Druze in the Golan and 'Palestine', who were notably singled out previously for their support for the Rijal al-Karama. In not referring to Israel by name, Rijal al-Karama reflects the Syrian consensus that does not recognize Israel as a state. This continues to rule out cooperation between Israel and the Rijal al-Karama to realize a Druze separatist project, which goes against the Syrian nationalist spirit of Rijal al-Karama- a spirit reinforced by the reverence for Druze leader Sultan Pasha al-Atrash, who led the Great Syrian Revolt/Revolution against the French occupation in the 1920s. There is also no evidence that Rijal al-Karama is any closer to anti-Assad Lebanese Druze leader Walid Jumblatt since Bal'ous' death. And do not reckon that those who have been killed in the path of God are dead, but rather are living, nurtured among their Lord- [Qur'an 3:169]. According to what happened from events in the recent period in the province of Suwayda including demonstrations and protests for the sake of realizing the rights of the citizens in the Jabal and that occurred over some days. But the most notable incident and momentous mishap that occurred was the assassination operation against the Sheikh of Dignity and his fortunate companions- this incident that changed many of the misunderstandings that were present on the field of this province. The Sheikh of Dignity is a unique personality, a difficult figure in this critical time of our life, and a personality that will not be replicated in this time of ours. The Sheikh of Dignity had worked to bring about a special culture: the culture of Dignity that was founded as a path to all the sons of the noble mountain, inside and outside it. 1. We are the guardians of the land, honour, and religion, rooted in the land of the homeland. 2. We forbid aggression on our part and we forbid aggression against us, for this is the outline of our just predecessors. 3. Syria is our motherland and we are an indivisible part of it, and we are not on the project of dividing it. 4. Our arms are our dignity and in them are the protection of our security, peace and they are a part of our body. 5. We are neither loyalists nor oppositionists, but nationalists, of Arab identity, of the people, and even people of humanity. And on these principles we pledge to you oh Sheikh of Dignity: that we remain on this pledge and unimpeded on your path. Both your blood and the blood of the martyrs of Dignity are a solemn pledge on our necks and Truth sought behind it will not die. And we are companions and seekers of Truth. This cowardly operation that also targeted one of the symbols of the homeland is linked to intelligence planning at the highest levels and the explosive devices used in the operation contained explosive materials that only states can possess. And they were present under the ground at a depth interval not exceeding two metres beneath the road. And that was on the road of the Dhuhur al-Jabal in the area of Ayn al-Marj and there was besides the explosive on the surface of the road a rigged pick-up car and the explosion was carried out from a distance in synchronization between the explosive and the car. And there was also a group of people present at a distance of not more than 200m from the place of the explosion from the east and north of the road. And their aim was to kill whatever remained alive from the convoy by firing multiple rounds of gunshots randomly on the convoy. In addition to the closing of the checkpoint and not allowing the arrival of ambulances to the place of the explosion, it was not even allowed for cars coming from Dhuhur al-Jabal to Suwayda [to enter] even as they might have provided aid to one of the wounded. Despite all that happened, the suggested and important question is what the reason is for the explosion that happened in the hospital...As for the comical theatrics of Wafid Abu Turaba and what concerns that and all the followings and media coverage of it on the television airwaves, they are a point of discussion for you. As for what concerns the three names: Rami al-Hussein, Salim Abu Mahmoud, Hamad al-Sahnawi. We for our part neither accuse them nor deem them innocent, but refer them to their associates to be judged. We offer them regards of love, esteem, reverence and tribute- for all the people of the Jabalin its sects and components. For we and you are one house. – The position of the triumvirate of the mashayakh al-aql is the head of the pyramid among us and it has all respect and valuation of esteem. And we note in particular our Sheikh- the Sheikh Abu Wa'el Hamoud al-Hanawi who was with us in all our circumstances and especially in our latest calamity. – Indeed our aim is one and our blood is one and according to this we have shared the bodies of our martyrs with our people in the graves and this is a noble distinction for us. – A question in tracing out the answer: why did Sultan Pasha al-Atrash- leader of the Great Syrian Revolt- depart from the Jabal in 1954? – Despite our great affliction on that dreaded day, we have not undertaken any act of destruction and we have not attacked any of the foundations of the state, and we disavow all that. – Indeed Rijal al-Karama are well-known inside the mountain and outside it, and we do not allow any person- whoever he may be- to infringe on their respected status or use their name in personal objectives beneath inquiry on our part. – Let all know that we continue on the pledge of our Sheikh in forming bayariq [banners] in all the villages and localities of the province: these banners that are the symbol of our honour and dignity and we will sacrifice for them with our souls and will remain raised till the Day of Judgment. – Indeed our soldier sons in this Jabal and on the passing of history they have waged battles against the Turks followed by the French. 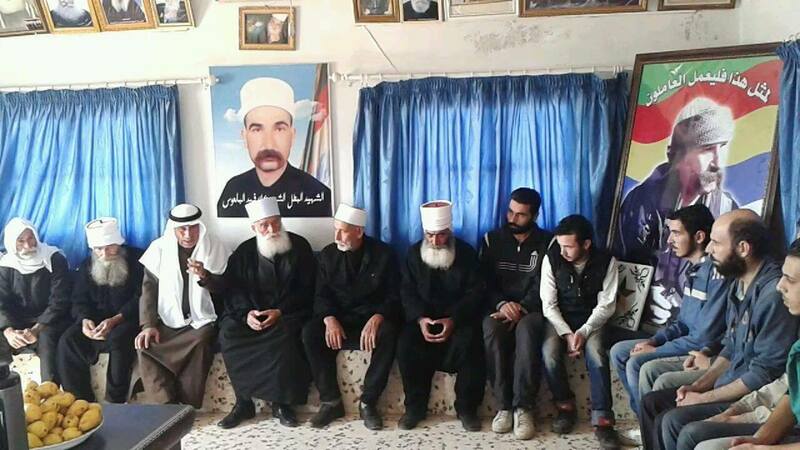 They have a history that no one can condemn from courage and sacrifices for the sake of this homeland Syria. – Working to hold to account all who transgress against our military sons from the various ranks and we do not accept attacks against them from anyone. And we inform you that our hands are extended into every place in this land. – Joining the army is a deed of choice, not compulsory, because the fighting in Syria is between Syrians themselves and we are innocent of every drop of blood and tear of a child. Thus, the decision to join goes back to the owner of the relation as a personal matter because we no longer know for whom this land is: is it for Iran or Hezbollah or Nusra or Da'esh [Islamic State] or is it for the Russian army that has entered our land? – We extend tribute to all our Syrian people who shared with us in our pains and sadness in our momentous calamity and we will not forget the stance of our people in the beloved Golan. – To our people in Lebanon, tribute of affection, reverence and recognition in what they offered from true participation whether in attending personally or through connection networks. And we note in particular those who established the funeral rite on their land and in their abode from mashayakh, leaders, officials and MPs. – Tribute of honour to our people in beloved Palestine for what they offered and continue to offer and expend for the sake of the dignity of the Jabal. – And all thanks are due to our people in Jordan on consoling us in our mishap and it is not far removed from them, for they are the ones who offered benevolent treatment to Sultan Pasha al-Atrash in his ordeal. – To all our people in exile in all the states of the world, including Arab and foreign, for them all thanks and respect for sharing with us in our affliction and we call on them to return safely to the land of the beloved homeland and we say to them that we are living in this homeland like falcons for the black summits. "And whether above the land with dignity or beneath the land with dignity...and ya hamlat Allah."